LONDON, November 13 -- As in New York UK Prime Minister Gordon Brown was quoted as in support of 3000 new peacekeepers to join what the UN says are 17,000 already in the Congo, elsewhere the UK government tells the Press that the UN has admitted to it having only 15,500 soldiers on the ground, while never publicly correctly the number. Which, if the UK is telling the truth both publicly and privately, would make the UK offer only half as significant as it seems, close observers opine. Several UK sources says that the UN's military adviser has acknowledged the force size is 15,500, even as UN Peacekeeping Chief Alain Le Roy has repeatedly said it is 17,000. More generally, while in New York the UK delegation to the United Nations defends itself against charges of dithering about the Congo, here in London the mood is one of caution and even disinterest, including from the officials ostensibly most concerned. Two days ago outside the Security Council chamber, Inner City Press asked UK Ambassador John Sawers to explain his country's sending of troops in 2000 to Sierra Leone, compared to what some are today calling the UK's dithering and even blocking of action by others in the European Union. "We're certainly not dithering or blocking," Ambassador Sawers relied. "All situations are different, as you understand the difference, you can't apply a solution from one area into another area." Video here, from Minute 5:49. But what substantively is the difference for the UK between Sierra Leone and the Congo? Or between 2000 and 2008? "we've gotten decent humanitarian response where the UK has been a big leader in it.... The decision was that probably the better and more effective way was to strengthen the UN force MONUC and so I met with Ban Ki-Moon as well as the senior UN leadership again at the end of last week to promise that we would work with them to do all we could to allow that strengthening to happen quickly enough, because obviously this is a crisis unfolding on a daily basis at the moment." The Channel Four questioner then said, "at the moment the UN force has five hundred troops in the area in which there are six thousand rebels." But if according to the UK we can't believe the 17,000 Congo-wide figure the UN gives, how can we believe the 500, 1000, or even 3000 counter-figures given? We will continue to follow this. 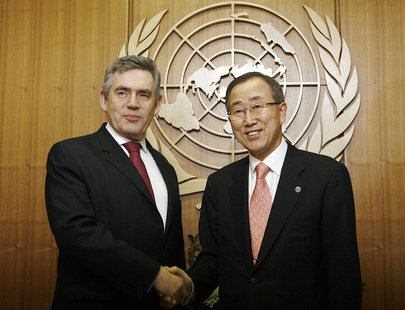 Footnote: In the UN General Assembly, Gordon Brown speechified the UK's "tribute especially to King Abdullah of Saudi Arabia - a man of great faith whose leadership has inspired this dialogue." Can you say, religious freedom? Or, willfull ignorance about a conflict of interest and failure to disclose about which the UK government's been asked?